I think the list is a great idea, because it’s a reminder that many of us – including us “millenials” – are trying to influence changes, even with our much smaller networks and less resources than our older and more established contemporaries. We are all working towards our goals and objectives, working within our communities however big or small, and ultimately dreaming of a better Brunei. I’m thankful to be acknowledged, in this way, for my previous efforts as co-founder of B:Read. If you’re wondering what else I do, I’m in the ICT industry and a casual contributor to Brunei Geek Meet. I’m a co-founder, webmaster, and an occasional editor and writer for Open Brunei. I run little mini-projects that are mostly to do with online archiving and compilations of Brunei-related materials. I also run this infrequent blog, and, like many others, try to share my voice and thoughts on Twitter, Instagram or Tumblr. I’d also like you to consider that whoever we are, everything we do is a contribution. Look, a great many of us want to “change the world” or at least our beloved Brunei. But there are days when you doubt yourself. On those days, I wonder how on earth I’ve impacted anything at all in this country; I try to remember that there are small circles around me, in family, work, friends, social circle A, social circle B, Twitter followers, and so on. We all have a community around us that we affect and impact, that in turn affects and impacts us. When changing the world feels too far beyond reach, we can go back to looking at the people who are immediately around us. 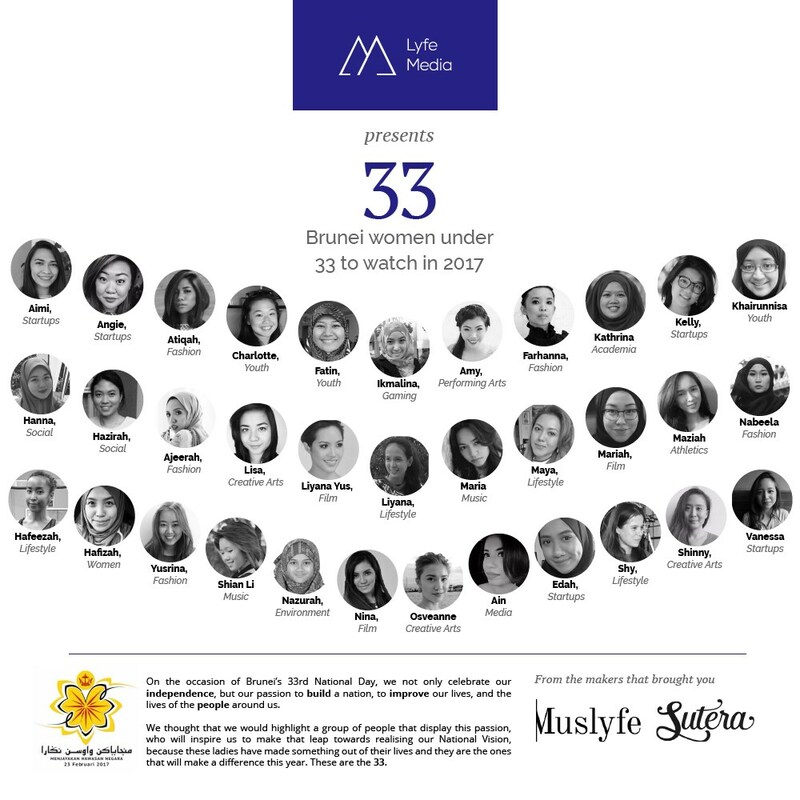 Back to the “33 under 33” list, I suggested a number of other women who, I felt, deserved to be listed and acknowledged. I suggested a friend who has done much to promote a lesser-known sport in Brunei. Her efforts ranged from supporting specific individuals to organising large events. I suggested a friend who runs a creative initiative and whose team is made up of women. The initiative promotes feminist issues and the team will fight you if spout any misogynistic BS. …And a few more. Ultimately, two of them were added to the list. Inevitably, with any list, we’ll miss out on lots of women we wish had more recognition. 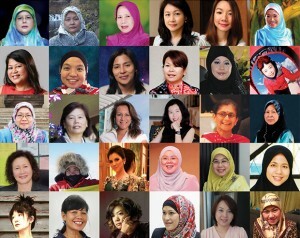 Women who make a difference in their specific, niche communities. Women who go out of their way to help the people around them. Women who push the boundaries in their work or efforts, who demand quality from themselves and from others. An acquaintance who headed a creative group with young people, continually nudging them for better quality. A social media queen, who tells us uncomfortable truths about gender in our society. Teacher friends, who every day are trying to mould their students’ minds and habits, surviving within the restraints of school administration. A humourist who effortlessly mirrors back odd Bruneian quirks in her social media posts. The artists who quietly share their works in progress, showing their imagination and dedication. Ultimately, I thought of the women in my life, and what they gave me or taught me, every little thing to every major lesson – they aren’t always virtuous or flawless, but themselves labouring through the challenges of their own lives. And wouldn’t all of us draw up different lists, if asked? All the women who had been shortlisted have made significant contributions and are equally inspiring, influential and impressive in their own way. We tried to be very pragmatic in our decision, to match the women on the list to the definition and criteria which we defined as ‘Influential’. Again, many of us are contributing or effecting others. Sometimes we don’t get or want recognition for it. Man, I cannot tell you how 5 years of B:Read started out with me wanting to be low-key. But eventually, I not only wanted our efforts to be good, I also wished that more people had told us, “Thank you”. And you know, life can be unfair; the loudest ones and the most connected ones will always get the most attention. It doesn’t mean the impact of our efforts is not felt, that we are not part of ripples of change and improvement. The impact is there. We are a part of change. Also, by the way? Make your own list! List out the women who have affected your life. List out the women who inspire you. Put it in on Instagram or Facebook, in a Tumblr post, in a Whatsapp group chat, or on a post-it note. International Women’s Day was on 8th March, but you don’t need to wait another year to share a list of the women you appreciate. It’s not just about women celebrating other women, but for all – whether you are a male or a female – to celebrate the people in our lives who, by consequence of their gender, may have gotten less thanks and recognition for their efforts.